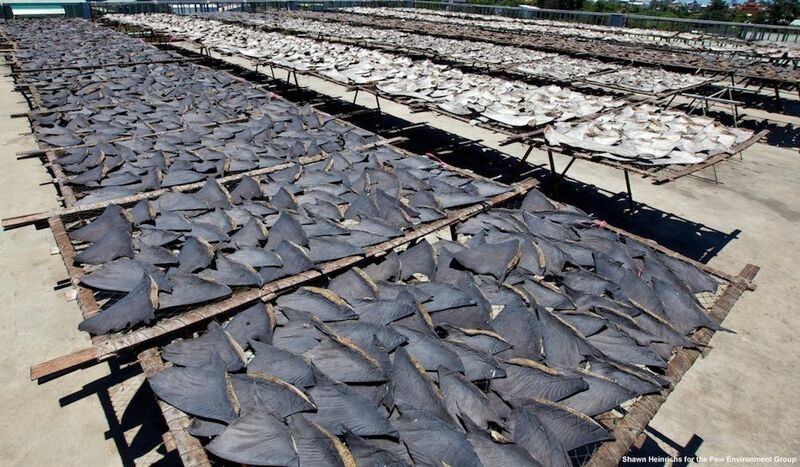 Many sharks are harvested for their fins, the main ingredient in shark fin soup. Good news for shark lovers: This weekend, new international laws will go into effect to strengthen protections for five shark species that are threatened by overfishing. Starting Sunday (Sept. 14), special permits will be required to export live specimens — as well as the meat, gills and fins — of five shark species and all manta ray species. The Convention on International Trade in Endangered Species of Wild Fauna and Flora, known as CITES, adopted the regulations at a meeting in Bangkok last year. The new laws apply to oceanic whitetip sharks (Carcharhinus longimanus), scalloped hammerhead sharks (Sphyrna lewini), great hammerhead sharks (Sphyrna mokarran), smooth hammerhead sharks (Sphyrna zygaena), porbeagle sharks (Lamna nasus) and all manta rays. Sharks are harvested for their meat, liver oil and cartilage, as well as their fins — the main ingredient in shark fin soup, which is considered a delicacy in parts of East Asia. Because sharks grow and reproduce at relatively slow rates, it can be difficult for their populations to bounce back from big losses. Conservationists have warned that overfishing could cause rapid declines in the top predators. In a study published in the journal Marine Policy last year, researchers estimated that 100 million sharks were killed in 2000 and 97 million were killed in 2010. Those numbers were based on available data of shark deaths and estimates of unreported illegal catches. Vasquez said the new laws should make it easier for authorities to identify the "bad guys in the business." He also warned that CITES and wildlife authorities will need to be vigilant, as fishermen could shift their focus to other species and other areas. In rolling out the new regulations, CITES has been working with national authorities and customs agencies who will be checking permits and looking for illegal shark parts at ports of entry. Vasquez said fisheries officials and environmentalists — who are sometimes at odds with one another — have been cooperating in implementing the new laws. "It's an amazing movement that we are witnessing here," Vasquez said. "For the first time, we are finding a way to bring these players together." The CITES Treaty is signed by 178 countries. At a meeting held every two to three years, representatives from each country review and negotiate changes for the international trade of animals and plants covered by the agreement.